Nearly every morning (we are talking really early, like 3 am early) my husband and I find our darling three year old in our bed. As darling as he is, it is not so darling when my hubby and I can hardly keep our eyes open for the day due to the lack of sleep we have had the previous night. It is time to do a little goal making for my little bed hog. 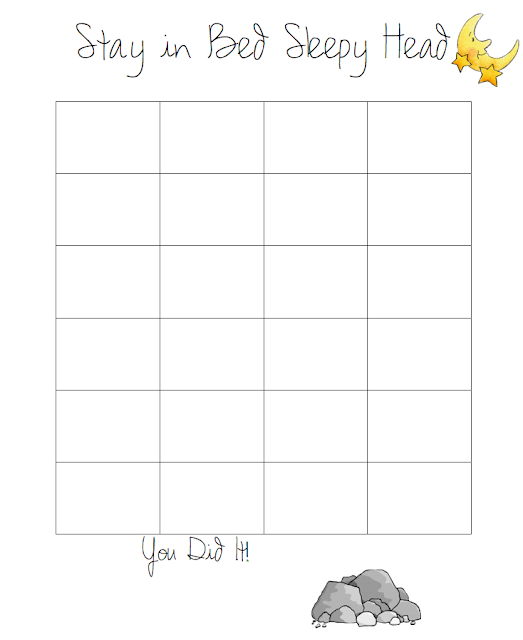 I decided to whip up the very simple sticker chart in pages. When he stays in his own bed until the sun comes up he will get a sticker to place in a square. He has chosen angry bird stickers to fill in the squares. Once all the squares are filled with stickers, my husband and I will take him on a special date to go rock climbing and kid friendly indoor facility. He has been wanting to do this for a while, and we have been wanting to take him. This will be a perfect excuse to take our little climber. Hopefully a good habit with be created with this chart. Please Bless! Here's to many more nights of blissful, uninterrupted, lovely sleep.